The popular Dutch band Kensington there leadsinger is provided with Elegant Curiosities’ items. Also, a part of the band's merchandise– namely, the jewelry is taken care of by our company. The picture below was taken at the MTV music awards. The lead singer is the one wearing a hat, which was customized by Elegant Curiosities with a headband. He’s also showing of several necklaces, all of them created by this company’s designer, Laila Verseput. Some of the items, similar to what the lead singer is wearing in the picture, are now available for the audience. Check out our etsy shop to find them! ​Picture in the center you can see Eloi Youssef with David Hasselhof, on the right ​you can see some of the merchandice jewelry, pendants with pictures but also pendants that are hand signed by all four band members. These are for sale at the band there merchandice shop. A French short film by Anna Usik (all right reserved). Elegant Curiosities was responsible for the headpiece used in this film. Click the ‘play’ button to start the clip. with Spike van Zoest (Di-rect and The Deaf) Originally created by the BBC’s Classical Music Department in the UK, the Netherlands also had a go with this reality TV talent show-themed television series. The show, much like it’s original counterpart, features eight celebrities (“famous amateurs with a passion for classical music”) competing for the chance to conduct a Concert Orchestra. Spike van Zoest was one of the competitors. While he was on air, he wore his Elegant Curiosities jewelry and bow-tie. We have provided you with some screen-shots of the broadcast in the picture below and a collage of items he wore. Our designer Laila Verseput had a contract with National Geographic provided Titanic artifact Exhibition in Amsterdam where she made a large collection for the giftshop from simple jewelry to hats and even jewelry and frames with real wood for the RMS Titanic. (pendant with Titanic wood are available in our webshop). Below: At the VIP press party our designer Laila Verseput with Paul-Henry Nargeolet, the director of theUnderwater Research Program RMS Titanic, Inc.
Picture on the right is a photocollage of (a part of the) collection, designed by Elegant Curiosities, that was available in Amsterdam Expo and also a view of the Elegant Curiosities items in the shop and our designer Laila Verseput. Featured in a clip about the National Geographic Titanic Artifact Exhibition vip opening. In this short clip, you can see our designer walking around the vip opening with two friends all wearing Elegant Curiosities items like jewelry, hats and the beetlewing/swarovski gown. Elegant Curiosities started colaborating with a new upcoming Dutch band The Cavern. Below left: The leadsinger Floortje van der Kooy backstage before going on stage wearing her Elegant Curiosities necklace. Right: Floortje visiting Elegant Curiosities workshop for custom fitting for harnesschain and jewelry for a music video. ​In the first moments of this clip Kensington leadsinger Eloi Youssef puts on his Elegant Curiosities and is wearing these throughout the rest of the video. After the contract for Amsterdam ended Elegant Curiosities had a contract with National Geographic provided Titanic artifact Exhibition in Belgium (brussels) where our designer made a collection for the giftshop from simple jewelry to jewelry and frames with real wood for the RMS Titanic. (pendant with Titanic wood are available in our webshop). On the picture you can see our designer Laila Verseput at the VIP press party also on the picture you can see Paul-Henry Nargeolet, the director of the Underwater Research Program RMS Titanic, Inc.
​The headpiece used in this clip and the necklace worn by Spike van Zoest are created by Elegant Curiosities. Below screen shots from the clip and a picture of Spike visiting Elegant Curiosities workshop. This is a clip of the second single from the Dutch band The Cavern‘s self titled debut EP. Made with Koen Dijkstra of the Creative Bros.
All of the members are wearing Elegant Curiosities items in this clip. Take a look at the picture below for some close-up’s. A two page interview about Elegant Curiosities was released in the American magazine ‘Gothic Beauty Magazine‘. Get your own copy at the Gothic Beauty Magazine website. Red carpet picture of the Dutch band Kensington here you can see the lead singer of the band with six Elegant Curiosities necklaces. The pieces he wore this year are all one of a kind and include ancient artifacts like Coptic beads, Celtic ring money, a Song-dynasty shipwreck coin and more. Below the picture is a interview where you can see Eloi Youssef wearing the Elegant Curiosities necklaces. Manuela Kemp (Dutch celebrity) before going on stage for Girls On The Rocks wearing an Elegant Curiosities’ harnesschain and a butterfly wing bracelet. Elegant Curiosities was invited by Spike van Zoest to attend their 15-year anniversary concert and the afterparty. It provided us with a great opportunity to see familiar faces and talk to various celebrities about possible collaborations. The top left picture: Di-react on stage with Spike wearing an Elegant Curiosities’ necklace and Vince a bow-tie. On the bottom right: our designer and Vince from Di-rect, wearing his Elegant Curiosities’ bow-tie and to the top right: our designer and Janneke from The deaf and The Indien, wearing the necklace 'Unwritten' (can be purchased in our webshop). Elegant Curiosities interview in the first edition of Maleficent magazine. Special preformance of Kensington at the Voice of Holland where 2 contestants would sing allong with there hit Streets. In the 2 clips below you can see the preformance and interview by radio 538 afterward where they received a gold record from Jamai for their album Rivals .You can see Eloi Youssef wearing His custom Elegant Curiosities hatband and Elegant Curiosities necklaces. Two segment from Di-rect’s ‘Clubtour’. In the clip on the left you can see Spike van Zoest wearing an Elegant Curiosities headpiece and the clip on the right an Elegant Curiosities taxidermy necklace. On the collage bellow you can see another picture from the guys in there tourbus with Spike wearing the Elegant Curiosities headpiece and on stage he was wearing a bowtie and relic pendant. Also on the collage a backstage picture with our designer and the lead singer of Di-rect. Below a video by well known bellydancer Mahafsoun. The footage is from Mahafsoun’s studio session. On youtube you can find many more of her video's and in several of them you can see the Elegant Curiosities bra. She is wearing a bellydance bra designed and created by Elegant Curiosities. Promo picture of the lead singer of UK band Izzys Daugther wearing her Elegant Curiosities headpiece. Photo by Derrick Wess Photography. Elegant Curiosities Haircrown was worn on the cover picture of Phantasm magazine by La Esmeralda. This piece was made custom to there hair color. ​The lead singer of this band, Eleine, was at first a model for Elegant Curiosities. Customers of our webshop will undoubtedly recognize her. We continued this co-operation after Eleine started her female front metalband. 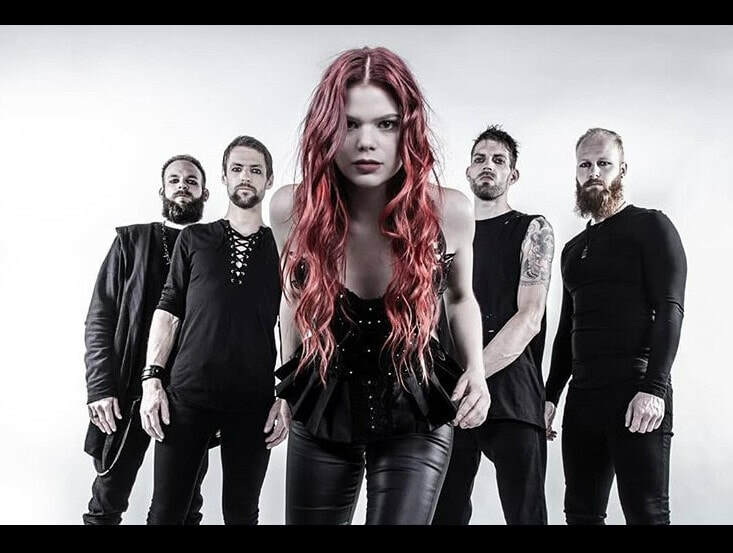 Below on the left you can see a picture of the band where Eleine is wearing a harnesschain and headchain provided by our company. On the right a collage of Eleinewearing her custom bra and hipchain on stage. Elegant Curiosities headpiece worn by Dani Divine on cover and five pictures in the magazine. Elegant Curiosities made some merchandice pendants for this Dutch band. ​The leadsinger Spike van Zoest (Di-rect and The Deaf) and bass and vocal Janneke Nijhuijs (The Deaf and The Indien) are wearing Elegant Curiosities jewelry for quite a while now. Below on the left you can see a collage of the merchandice necklace, our designer Laila Verseput backstage with the band and Spike and Janneke on stage wearing some Elegant Curiosities items. On the right a picture collage so you can see one of the pieces Janneke wears on stage. This is the official music video of the Dutch band Kensington for their single ‘Riddles’. The necklaces of the lead singer were created by Elegant Curiosities. The antler style necklace and karma rosary model necklace he is wearing in this are for sale in our Etsy shop. On the left Therenody in Velvet wearing Elegant Curiosities armchains and on the right flyer the model is wearing an Elegant Curiosities headpiece. The german band Qntal had a promo shoot by photographer Viona art where the lead singer of the band wore an Elegant Curiosities headpiece. The pictures where used for the band there website and for flyers etc. On the cover of Irresistible fusion magazine model La Dutchessa is wearing an Elegant Curiosities harness chains, arm chains and the g.o.t inspired headchain. Picture was taken by Dageraad Fotografie. Elegant Curiosities jewelry are seen allot worn on television by the lead singer of Kensington below two pictures of tv show RTL late night and ​3fm serious request Het glazen huis. ​Custom bra and armchains worn by Mahafsoun on the cover of Eye pie magazine. More pictures of Kensington at awards shows etc where the lead singer is wearing Elegant Curiosities jewelry. Dani Divine wearing Elegant Curiosities’ armchains, headchain and harnesschain on the cover and the picture accompanying her interview in Twisted Edge Magazine. Left: Threnody in Velvet, Center: Troys Seductment, Right: Natalia La Fay Art. Leadsinger of the Dutch band Asrai wearing and Elegant Curiosities custom bolero on stage. Publication in Phantasm Magazine here you can see model La Esmeralda wearing a custom Elegant Curiosities haircrown. New band colaboration! 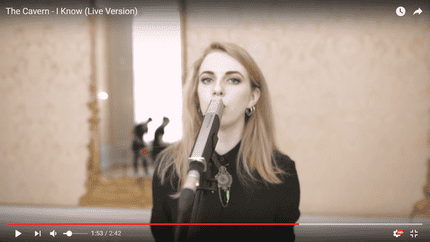 In the new music video of Skarlett Riot you can see the lead singer ( Chloe Drinkwater ) wearing a simple custom Elegant Curiosities harness chain. Below a picture collage of the harnesschain , Chloe wearing it and a band picture. On the right a on stage picture where she is wearing an Elegant Curiosities necklace. This is the official music video of the Dutch band Kensington for their single ‘Do I ever’. The necklaces of the lead singer were created by Elegant Curiosities. The necklaces are only visible from 0:11 to 0:26. At 0:23 you see hands taking the necklaces of his neck while he is crowd surfing. New music video (live version) of 'I Know' by The Cavern. Here you can see lead singer Floortje van der Kooy and her brother Pepijn wearing an Elegant Curiosities necklace. Below you can see the Belgium fire dancer Victoria Rose wearing Elegant Curiosities pasties and harnesschain while performing. Picture left: Stecor Photography , Right: Randal Thilleman photography. Below you can see pictures of burlesque performer Silly thanh from Switzerland wearing an Elegant Curiosities headdress for one of her acts. Photography:Neil Kendall. Featured on the 2017 Oxford conference of corsetry flyer you can see Model Threnody in Velvet wearing Elegant Curiosities jewelry and haircrown. Below you can see a picture of Clea de velours wearing an Elegant Curiosities haircrown. Picture left by Soleneballesta . Below you can see the lead singer of Blackbriar wearing her Elegant Curiosities corset. Picture on the left by Maurice Vos. Disclaimer: Music and imagery belong to the artist. We do not own this in any way. All items related to us, and thus our creative property, are mentioned in the short description. Thank you for stopping by. We hope you will enjoy.